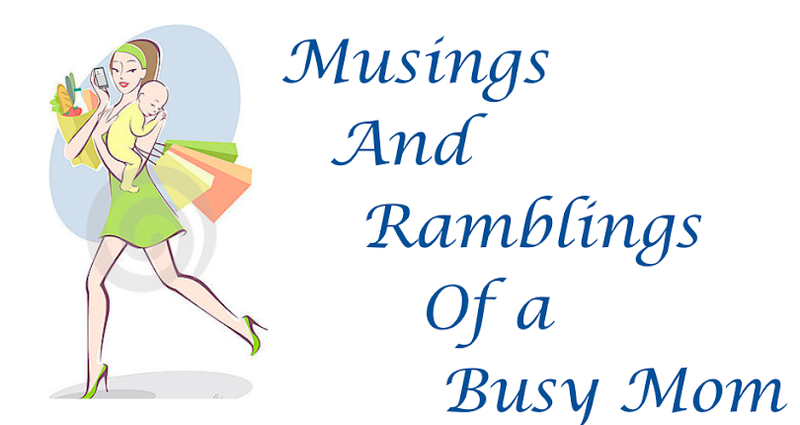 As you know from my previous posts, I am very into using all natural products in my home, and whenever possible to make them myself. Well, today while I was doing my daughter's laundry I realized that I didn't have an all natural stain remover for all those wonderful preschooler stains! So I hit the Internet searching for the most effective DIY stain remover out there, and I found it! However, it wasn't all natural so I started messing around with alternatives to the original recipe, and came up with something very similar but all natural. My biggest issue was the Dawn dish soap, I don't really like using it because it's not a natural item and I am trying to remove unnecessary chemicals from my home! So with just a little tweaking I created this new and improved all natural recipe which I hope you guys fall in love with as quickly as I did! *Note: This recipe is for a small amount of solution, it was enough for me to spot clean the major stains on my daughter's clothes. Because the hydrogen peroxide looses effectiveness with light you don't want to make too much solution at one time. If you need more then just do one part dish soap to two parts hydrogen peroxide and adjust the baking soda accordingly to keep the solution the consistency of a thin paste. Step 1: Put the baking soda into your dish first (I found this made mixing the solution easier). Step 2: Put in the dish soap and hydrogen peroxide (try to do this in a dimly lit room so you don't disrupt the effectiveness of the peroxide. Step 3: Mix all three ingredients together. You should get a thin paste that stays on the toothbrush with some slight run off. It shouldn't be a complete paste, kind of the consistency of watered down toothpaste. Step 4: Rub the solution directly into the stain with the toothbrush. You want to really work the solution into the stain. Here I'm trying the solution out on set in PLAY-DOH stains on my daughter's WHITE pants! Step 5: Wash all of the clothes as usual. *Tip: If the stain is set in then rub the solution into the stain, let sit for five minutes, rinse thoroughly then rub solution in again and let sit for 30 minutes to an hour, then wash as usual. This is usually enough to remove the stain, if the stain has been on the garment for a long period of time, let solution sit on stain for at least an hour then wash, then repeat the entire process again. 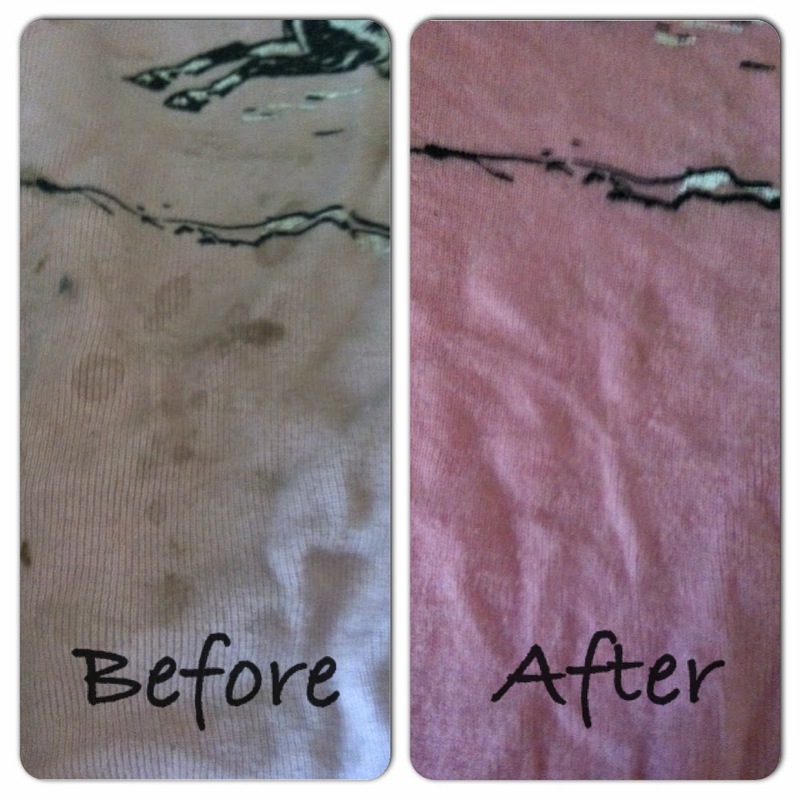 It worked on removing set in DIRT and PLAY-DOH stains from WHITE pants after ONE application! These were set in dirt and grime stains from my daughter's trip to my mom's ranch LAST WEEK! Came out on the first try! The color difference is because the shirt was still wet, I took the picture fresh out of the wash because I was so excited! Well, I hope this tutorial was helpful to all of you and that I was able to give you one more way to get the unnecessary chemicals out of your home! 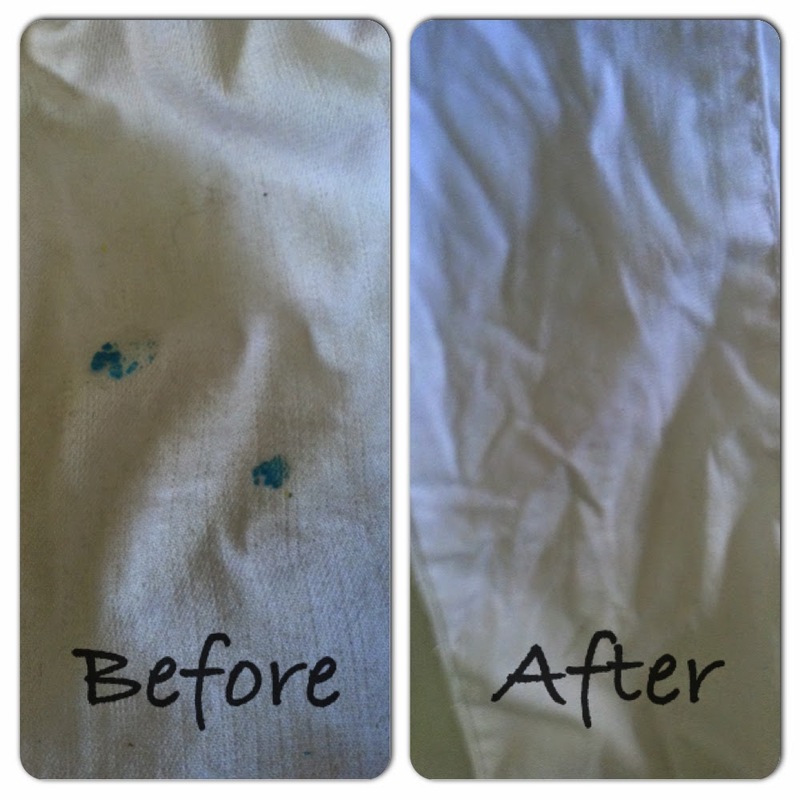 I was truly amazed at how well this solution worked with getting out these stains, I honestly thought I was going to have to throw out those white pants, but they lived to see another day!